No celebrity is as excited and obsessed with Halloween as America’s Got Talent’s judge Heidi Klum. Since 2001, Klum has consistently hosted an annual Halloween party people rave over. She has not been a let-down as a Halloween party host. Each year, Klum is adorned with a well-thought out and cleverly put-together costume in the spirit of Halloween. This year, even before October rolled around, Heidi has already began working on her next Halloween costume masterpiece. 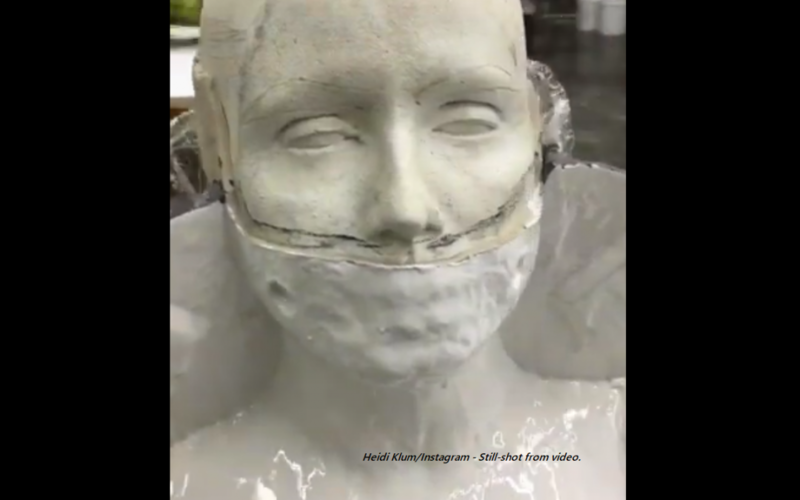 In an Instagram video, Klum gave a glimpse of her costume still in the works. It revealed a face mask being designed but at the time incomplete. With her reputation, Heidi must have a scary plot up her sleeve…or a fancy and creative one, for sure! In 2015, Klum pulled off one of her most spoken about costumes, taking the persona of Jessica Rabbit in a fancy red dress and a face that brought out the character. In 2014, Klum dressed up as a huge butterfly with an impressive fusion of color, style, and creativity. In 2011, Klum was in an ape costume alongside her then husband, complete with prosthetic ape breasts to differentiate gender. In 2010, she transformed herself into a shiny, red and purple robot with hydraulic shoes. It is known in the public domain that Klum does not take Halloween jokingly, and contracts the services of professionals to create her costumes and customize her Halloween looks. We’re excited to see what she comes out with this Halloween! Let us know in the comments below which of Heidi Klum’s Halloween costumes is your favorite!